Arcaydis EB1S review | What Hi-Fi? The long-awaited return of Arcaydis Audio to the pages of What Hi-Fi? requires a little explanation. But despite us needing to flick back the archives ten years (it’s actually been 20 since the company’s humble beginnings), we’ll keep it short and sweet. The company made the original five-star EB1s under the EB Acoustics name. But due to self-confessed failings in production schedules and deliveries down the line, the owner pulled the plug on the company in late 2013. However, after a three-and-a-half year hiatus Arcaydis has returned. And so have its once-trademark EB1 standmounters. ‘An old name with a new beginning’ is how Arcaydis describes itself, and it’s now a family firm run by two brothers. But it isn’t quite a case of wiping slates clean and starting again from scratch. Essentially, original designs have been dusted off and components from the original suppliers used to ensure the new speakers are as close to the old ones as possible – after all, why tinker with a successful formula? Some changes have been made along the way, though, from upgraded capacitors to manufacturing methods and the logo and packaging design. The EB1Ss feature the 28mm silk dome tweeter fitted only to the latter production run of both former speakers, but the crossover design has been altered and is now built on a circuit board to allow for greater consistency. Hoping to diminish any potential customer’s (perfectly reasonable) doubts regarding deliveries, Arcaydis no longer builds to order but for stock. Cabinet making, previously done in-house, is now outsourced for improved finish quality. And there's a new white finish to accompany the wood and black choices. Considering the engineering consistency between the EB1 and EB1S speakers, then, it’s hardly surprisingly we hear (solely from memory) a distinct homogeneity between their characters. Entertaining, well-integrated and rhythmically sound, they sound well within their comfort range no matter the music we put them through. 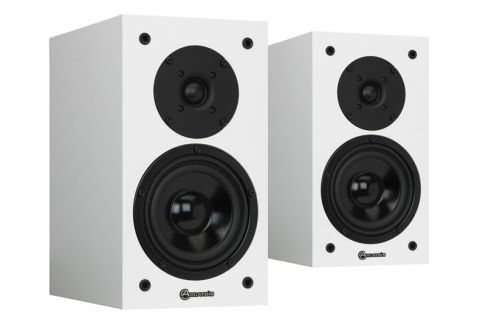 They don’t possess the Dynaudio Emit M20’s scale or authority, although for diminutive speakers it’s fair to say they meet expectations on these fronts. While smaller in size, and consequently smaller in presence, than their closest rivals, the Arcaydis’ won't sound deficient in a modestly sized abode. They're certainly happiest in proximity to a wall, particularly the reinforcement a rear wall offers – out in the open, there’s a shortage of solidity to their sound. Listen to Elvis Costello’s Pony St and the EB1Ss turn in a cheerful, up-for-it performance: the urgency of the jangly keyboards and effervescent bassline prods at you until you start moving, stirring emotions similar to that of your first club-night shuffle. They’re careful not to go over the top, mind, seemingly aware of the fact there’s a lot to be said for having an ‘easy listening’ side. Generally, the presentation is well balanced – there’s no rolling-off of the treble, mids have warmth and a spring-fresh breeziness about them and, down south, notes prioritise both depth and agility. In fact, each note of an instrument and utterance of lyric is rendered with clarity, and that (combined with cohesion and natural fluidity throughout the frequency range) makes their delivery a delight to listen to. Not quite as rhythm-obsessed as the Dynaudios, but equally adept at timing, the EB1Ss dutifully map out the rhythmic pattern of 65daysofstatic’s Prisms and bring order to the anarchic polyrhythms cartwheeling through Radiohead’s Bloom, organising melodies with an equal sense of careful consideration and laissez-faire attitude. However, the Arcaydis’ bugbear is a lack of insight compared to the aforementioned class leader. Textures aren’t delivered all that richly, and there’s a general sense of information being withheld. The impressive calibre of sonic transparency we’ve become accustomed to at this price is a credit to the ever-progressing industry, but it does in turn reflect our expectations. Sadly the Arcaydis’ don’t quite meet them. We’re glad the Arcaydis name is back from the dead - it deserves a chance to overturn any ill-feeling lingering on from the original EB1s. The more conventional manufacturing processes should be reliable, and those spending money here will no doubt find pleasure in the EB1S’ lively, tonally balanced nature. The Return Of The EB1s script could have been a lot worse – but also, to be honest, quite a lot better. Ultimately, time waits for no man (or indeed speaker) and the improvement in quality over the years still sees the Arcaydis left somewhat trailing in the dust of more talented rivals.